How to register to a PBX using SIP Account? 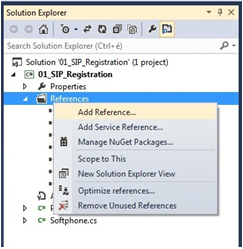 Here you can learn how to add reference to Ozeki VoIP SIP SDK, in Visual Studio, and how to create a console application softphone, which is able to register to a PBX, specified by the user's input. If you want to create your own application to reproduce this solution, You have to create a new console application in Visual Studio. 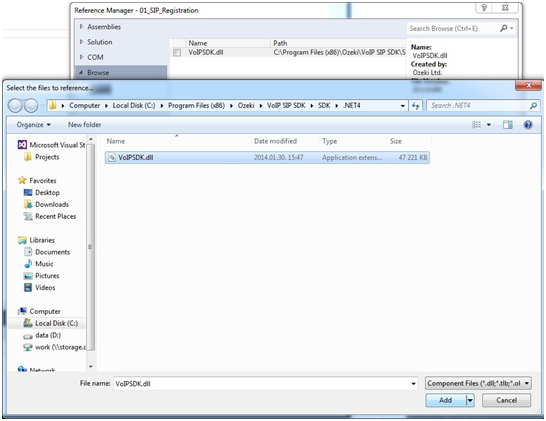 Figure 2 - under the Reference Manager's Browse tab, we need to browse for the "ozeki.dll" file at the installation path. If You followed these steps, You can find a new line at the end of the References folder: "VoIPSDK". This line indicates, that You can use the tools, provided by the SDK. The softphone's implementation goes here, all of it's events, methods, functions, variables. Our class with the Main() method, this class controls the console window, interacts with the user, by using a softphone object. Without these lines we would have to use the namespace information as a label for all tools of the SDK. What is Softphone.cs used for? This class is used to introduce how to declare, define and initialize a softphone, how to handle some of the Ozeki VoIP SIP SDK's events and how to use some of that's functions. In other words, we would like to create a "telephone software", which has the same functions (or much more), as an ordinary mobile (or any other) phone. In the Program.cs class we will use this class to create a new softphone, so we can use the functions, we can listen to the events placed here. What objects does the softphone class use? In a constructor, we also initialize this softphone with default parameters. We need to set the port range, indicated by the first two parameters as the minimum port's and the maximum port's number, this is the port's interval. If we have any firewall rule which restricts the usable ports, we can set the usable port range here, which will be used during the calls. These are sample ports only in the example, but a softphone with these parameters can be used in the most of the cases. Please note that, if You are handling conference calls, or handling a lot of lines simultaneously, You will need a wide port range. How to register to a PBX? To be able to communicate, we need to register our softphone to a PBX. To do this, the example uses the Register method. We need to create a phone line for this registration, which needs a SIP account and a NAT Traversal method. RegistrationRequired: is the registration required or not? This field needs to be set to "true", if we would like to receive incoming calls. DisplayName: a name to be displayed at the called client. UserName: if an other client dials this name (number), we are getting called. AuthenticationId: an identifier to the PBX, like a login name. RegisterPassword: the password to register to the PBX. Works in pair with the authentication ID. DomainHost: a domain name, an IP address, for example. The last two values are defining the PBX to try to register to. We will get the values for these parameters from the user, in the Program.cs file. How to set up a PhoneLine object? What events are should be handled by the softphone? Error: occurs, when registration is needed, but couldn't be made. The phone is unable to communicate through the PBX or other error occurs. NoRegNeeded: there is no communication with the server, until the first (made) call. If we've set any invalid information at the SIP account's creation, we can't even make that call. Since our softphone is not registered to the server, we can't receive any calls, even with valid SIP account. RegistrationSucceeded: occurs, when registration is needed, and succeeded. The phone is able to receive and make calls. There are more states as well, but we will use only this four in this example. The using of these sates will be introduced at the Program.cs chapter. What is Program.cs used for? This class will introduce the usage of a softphone object, handles the console events, interacts with the user, and uses the opportunities provided by the Softphone class. In this example, the softphone can only register to a PBX by the values given by the user. First of all, we must create a softphone object. We are handling everything with separated methods. These methods are communicating with each other, and making the source code more understandable and reusable. How to initialize the softphone? Call this method in the Main() method. Now, there is a new softphone available to use, and it's already following the phone line's states. We will see how to handle the states below, after we are done with the welcoming and the registration process. How to show a greeting message? In a few lines we are introducing the application to the user. It's preferred to tell about the available functions to use. After our softphone has been initialized, call this method to introduce the application in the Main() method. In the example's source code You can find a Read() method. With the usage of that method we can set if the asked information must be enter by the user (so, we need to ask for it again and again), or we can set a default parameter instead of that. You can create your own procedure to get the necessary values from the user. The example shows only a sample way to do it. When the user set up the account, this method starts the registration process. The result of the registration will change the phone line's state, so the next steps will be handled in that chapter. We should call this method in the Main() method, after the greetings. How to handle the phone line states? In the next examples, we will work with our softphone if the registration was successful, but in this example, it's enough to notify the user about the succeeded connection. What is BlockExit() used for? You can see a method, called BlockExit() in this Program.cs file. This method's function is to don't let the application to exit, so we can register (or in later examples; make or receive calls) while we would like to. You can write other solutions to solve this, but You won't need anything like this if You are working with Windows Form applications. After reading this documentation and studying the source code, we must be familiar about how to add reference to the Ozeki VoIP SIP SDK, how to create a Softphone class which provides a softphone object to the user with the input setups. We have a console window which is interacting with the user and handling our softphone with the provided opportunities.